Prepare the soup: Place the olive oil in a large pot over medium-high heat. Add the onions, salt, and pepper, and cook for 5 minutes, stirring constantly. Add the wine and vinegar and cook for 10 minutes, stirring frequently and adding small amounts of vegetable stock if necessary to prevent sticking. Lower the heat to medium, add the vegetable stock and herbs to the pot, and cook for 15 minutes, stirring occasionally. Meanwhile, prepare the croutons: Set the oven to broil and oil a baking sheet. Slice the baguette into ½-inch slices and place on the prepared baking sheet. Baste with olive oil and sprinkle with salt and pepper. Broil for 5 minutes, or until the bread is crispy. To serve, remove the bay leaves and thyme sprigs. Pour the soup into oven-safe bowls, add a baguette slice, and sprinkle the top with vegan cheese. Place under the broiler until the cheese melts, about 5 minutes. 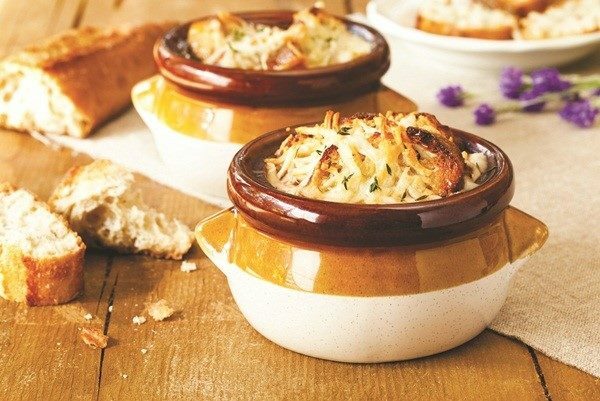 If you do not have oven-safe bowls, simply top with the cheese before serving.